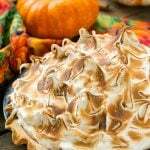 The most delicious pumpkin meringue pie – the mountain of toasted brown sugar meringue on top is the crowning glory! You haven’t experienced pumpkin pie until you’ve tried this impressive pumpkin meringue pie. It is a must make for Thanksgiving! I have a confession to make. I’m not a big fan of standard pumpkin pie – it’s just….not very exciting to me. 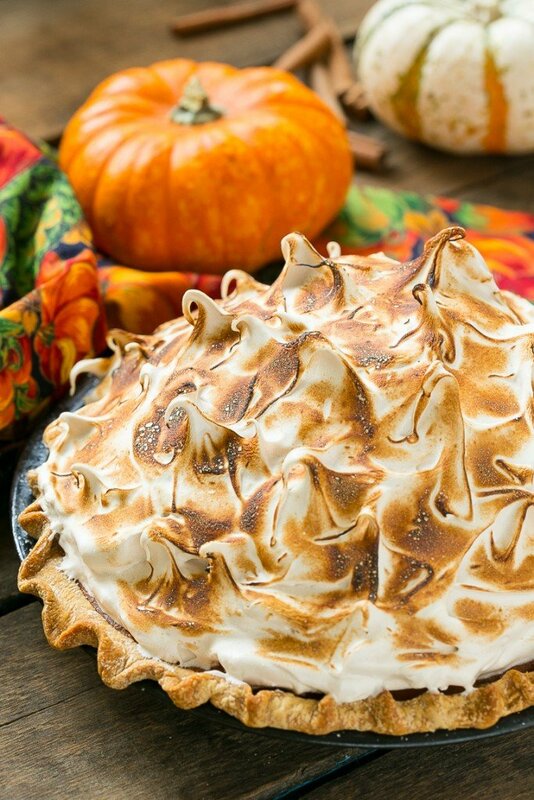 But this pumpkin meringue pie? It’s so good you’ll want to make it year round. This is an absolute must-have on my Thanksgiving table every year. Here’s confession #2 – I haven’t made my own pie crust in ages. I always have such a long cooking to-do list around the holidays that I end up running out of time and buying a pre-made crust. Really, the crust is not the focus of this recipe, it’s all about that fluffy brown sugar meringue. If you want to make your own pie crust, that’s great. If not, grab a good quality store bought version and you’ll still have an amazing pie. This pie does require a few specialty kitchen tools; a candy thermometer and a torch. You don’t have to buy one of those expensive culinary torches, any small inexpensive torch from the hardware store will do. How do you make pumpkin meringue pie? Clearly this pie is just as much about the meringue as it is the pumpkin filling, but the filling here is extra silky thanks to a special ingredient. While most pumpkin pie recipes use evaporated milk, this one uses cream. In addition, all of the filling ingredients are pureed together in the food processor for the smoothest, creamiest filling. Have I convinced you to put a pumpkin meringue pie on your holiday table? You’ll never go back to regular pumpkin pie after you make this version! 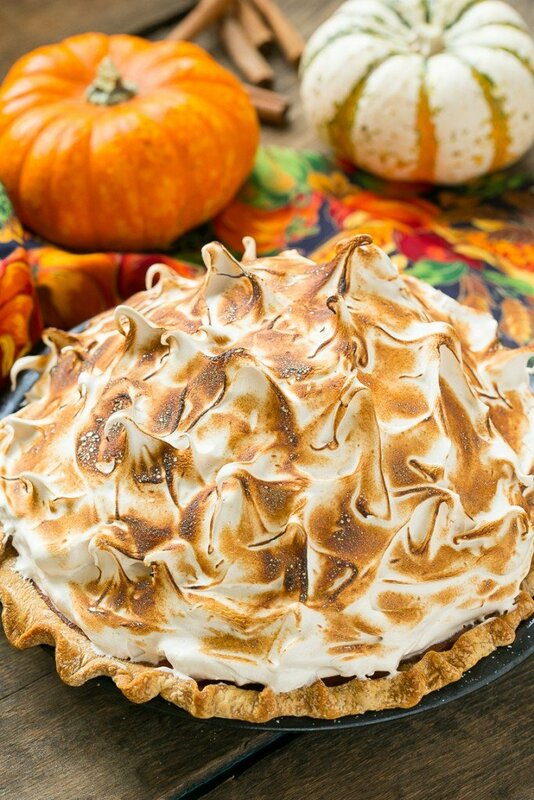 This pumpkin pie is topped with a mountain of toasted brown sugar meringue. Preheat the oven to 375°F. Spray 9-inch deep pie dish with cooking spray. Roll out dough on a floured surface to a 12 inch round. Transfer to prepared dish. Fold the edges under and crimp, forming a decorative border. Line the crust with foil that has been coated with cooking spray; fill with dried beans. Bake for 15 minutes. Remove the foil and beans. Bake until the edges are light golden brown about 7 minutes. If bubbles form, press the crust gently with the back of a fork if bubbles form. Cool 10 minutes. Reduce oven temperature to 350°F. Puree pumpkin in processor. Mix in next 5 ingredients. Add eggs 1 at a time, pulsing after each addition. Gradually add the cream in a thin stream, processing just until blended. Process 5 seconds longer. Pour the filling into the crust. Bake until edges are puffed and center is set, about 1 hour. Cool completely on rack. Place the egg whites and cream of tartar into a stand mixer fitted with a whisk attachment. Place the brown sugar into a medium heavy saucepan and add just enough water to cover. Put your candy thermometer on the pan and turn the heat to high. When the sugar reaches 240 degrees, start whipping the egg whites by turning your mixer to high speed; you want the egg whites to be foamy and starting to thicken before you add the sugar syrup. When the sugar reaches 245 degrees, remove the thermometer from the pan and turn the mixer speed down to medium. Pour the sugar into the egg whites in a thin, steady stream avoiding the moving whisk. When all the sugar has been added, continue whipping until the meringue reaches the firm peak stage. Quickly spread the meringue over the pie with a large spoon or offset spatula. 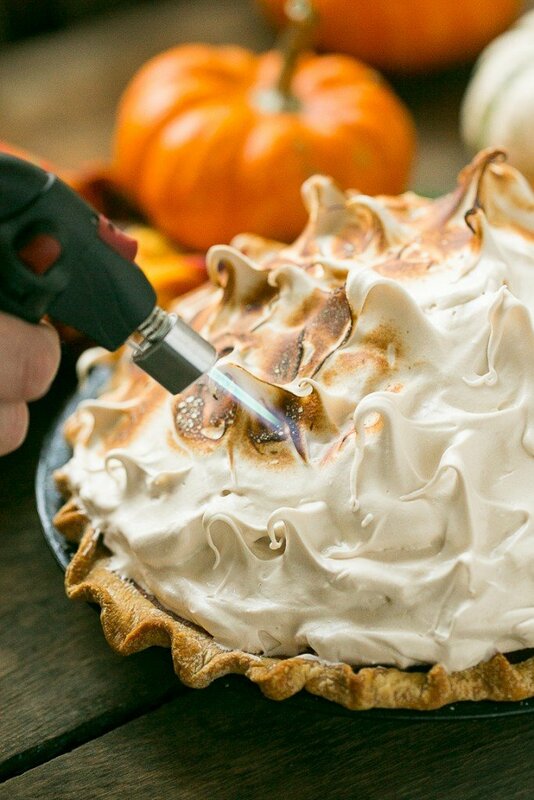 Use your torch to brown the outside of the meringue. Store the pie in the fridge for up to 3 hours. wow does this look pretty. not being a baker, I could definitely not make those meringue swirls pretty at all! But what a pie! Thanks Mimi! I actually just use the back of a spoon, it’s easier than it looks! How long does the brown suga mergniue take?! Thanks???? The brown sugar meringue takes about 15 minutes to make! What a beautiful pie! I have a pumpkin filling lover so I’m wondering if I could double the amount of filling on this to be more pumpkin-y? The filling in this pie is pretty standard for a typical pumpkin pie, if you doubled it you would want to use a deep dish pie plate. Otherwise you could cut the amount of meringue in half for a more proportionate meringue to filling ratio! When it calls for cream, is that whipping cream? What if I don’t have kosher salt ? Yes, it’s whipping cream or heavy cream. You can use any type of salt! I did put mine in the oven to brown and it turned out great, I did use the torch after but just to give it an extra finished look. Can you make this meringue with a white sugar syrup for a whiter meringue on lemon Pie and if so are the measurements the same for the syrup? Glad you liked it! You should be able to substitute the same amount of white sugar! Mmmmmm I can not wait to make this magical pie! Though is there an alternative to using the torch? Granted I know an oven doesn’t deliver the outstanding results of using a torch but could I use the oven just the same? You could try broiling it in the oven for just a few minutes, watch carefully to make sure it doesn’t burn! This is beautiful! I have never attempted meringue but I think I have to try. I bet this would be so pretty on a holiday table. Lovely twist on a classical pumpkin pie recipe…. Amazing topping and genius idea with the meringue. Wow, look at that topping! I’ve actually never had (or even heard of!) 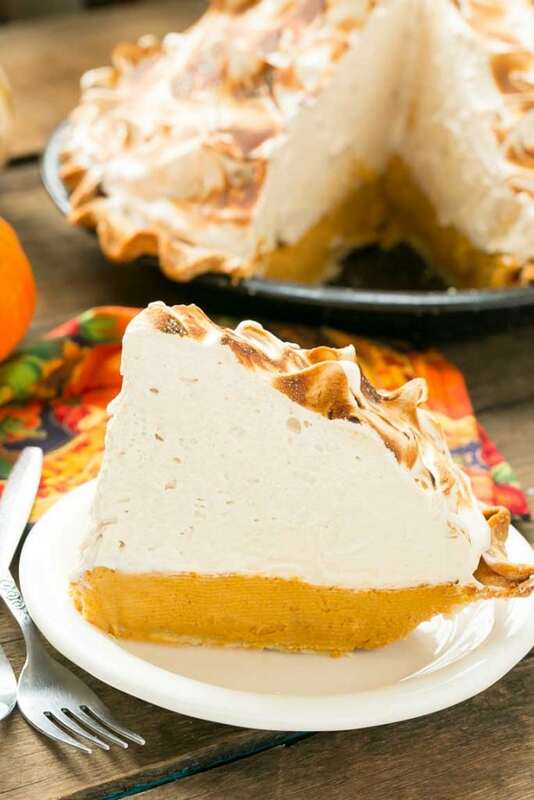 meringue on a pumpkin pie but am imagining the flavors and textures now – such a delicious idea! That is one fantabulous meringue pie! You certainly have inspired me and I also now want to buy a torch!!! And don’t feel guilty about the crust – I do that all the time and with that delicious filling – no one will care if it’s homemade or not. Love this!!! This pumpkin pie is gorgeous, and it sounds so delicious! Meringue and Pumpkin- what a delight. I will definitely have to try that combination. Thanks for sharing!